A 27-year-old man and a 23-year-old woman, both from Staines-upon-Thames, were arrested yesterday (25 February), on suspicion of causing grievous bodily harm. A 29-year-old man was arrested on Saturday (23 February), on suspicion of causing grievous bodily harm with intent following the incident. All three have been interviewed and released on bail while our investigation continues. We are still appealing for witnesses after officers were called to Gloucester Crescent at approximately 1.30am to reports of a fight between a group of between 5 to 6 men, who were reported to have baseball bats and knives. Two men were treated for serious injuries following the incident. Detective Sergeant Mark Fordham, from the North Surrey Criminal Investigation Department said: "Although we have made a number of arrests in relation to this incident, we are still trying to establish what exactly occurred. 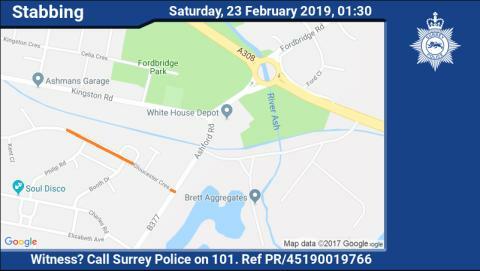 If you have any information you should contact Surrey Police on 101 or tell us online via or http://surrey.police.uk/TellUsMore quoting reference PR/45190019766.